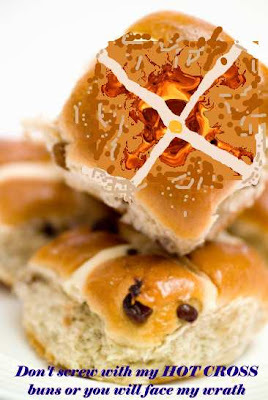 Woolworth's you are a bunch of idiots and wallies and any other supermarket or chain who puts Muslim halaal certification stickers or marks on its hot cross buns is the same just plain insensitive. God almighty man hot cross buns are “And i don’t care who the hell you are and what your stupid disposition is” a Christian bun traditionally bought out at Easter to celebrate Christ. This is a matter of principal and moral propensity i am so tired of everybody bending over backwards to satisfy the minority. If you don’t stand for something you stand for nothing. Well i stand for my faith and at some point stupidity seems to have caught up with me but let me tell you that if believing in something wholeheartedly and with conviction is stupid then i fit that suit perfectly regarding this subject. I am a Christian and having a Muslim have to approve and bless my food which is of a Christian nature and a religious celebratory food then i am going to get upset and if a heathen or agnostic or whatever you may be cant understand that then let me put it in simple lay terms for you. It is akin to going over the road to your neighbour who is a vegetarian and shitting on his doorstep and when he complains saying don’t worry i only ate vegetables its safe. So in short people we all have our sensitivities but don’t play with religion it the fastest way to piss people off. If you are not a Christian or Muslim this should not concern you but i tell you one thing Woolworth's the backlash will be hard and fast this is still a predominantly Christian country don’t underestimate the power and the mass effect of Christians, Top TV tried to take them on and failed just something to think about! You want to eat my what cake?